[Archon Nemesis] Nemesis leads the Kabal of Lost Souls, a force built on the remains of the Kabal of Lament which Nemesis herself brought to its knees. 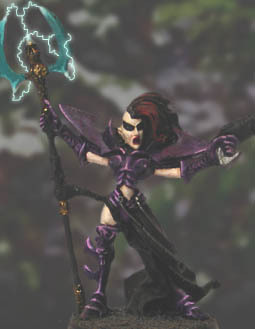 She rebuilt the Kabal to suit her own tastes, seeking out unique and exotic warriors to lead her warhosts across the galaxy. Although she needs no souls to keep herself alive as other Lords do, Nemesis has an insatiable hunger for the dark torments which she inflicts on her captives. She is driven by her own will alone, never denying herself any goals, even if the cost of a passing fancy is hundreds of lives. The home of the Kabal of Lost Souls, the Ice Palace, is a place of pure beauty, in which Nemesis and her followers pursue their hellish delights, untouched by any notion of restraint. Nemesis ventures out into the galaxy whenever the mood takes her, leaving a trail of devastation in her wake. A scream died away, turning into a harsh rattling sound as its owner's throat failed him. Nemesis paused, lifting the thin, delicate blade she had been using. She absently let it waver above the flame of a candle as she leaned closer to her victim, staring into his eyes. "I could stop," she said softly, "right now. No more. All you have to do is ask. You will be spared what comes next, and feel no more." "Do you want me to stop?" She leaned down, whispering into his tattered, bleeding ear. "Or do you want to feel everything? Even at the cost of your life? Say it..." She bit lightly, tasting the blood. "...don't..." his voice rasped through his broken throat, "don't stop..."
Nemesis smiled to herself, bringing the blade back into the prisoner's vision. He looked at it, glowing blood red, his eyes a strange mix of terror and longing. Again the glittering corridors and passageways of the Ice Palace echoed with the screams of a soul's death. Nemesis has no respect for any needs or desires other than her own, but the range of her desires is almost limitless. Her sense of self-restraint is practically non-existant - she will do whatever pleases her. The consequences to other people only matter to her insofar as she considers them important to her - the warriors she has gathered to lead her warhosts need not fear her so long as they do not displease her. Since her initial massacre of the Kabal of Lament's leaders she has rarely killed her own warriors - if they fail her she prefers to 'educate' them so that they will strive harder to please her in the future. Those captives she takes a personal interest in are not so fortunate - she occupies herself by attending to them until they die, their minds and bodies broken beyond repair. Nemesis is unpredictable to an extreme degree, destroying one world and leaving another alone for no discernable reason. She has no constant allies among the other Lords, but equally she has no true enemies - she simply does what she pleases, and gives no thought to the consequences to others. Other Archons have long since given up trying to understand her, and now simply keep their distance, unwilling to attract her attention without knowing what result it would bring. "It is perhaps fitting that my Mistress Nemesis should be the one to bring about the new age of our people. Others would shy away from such awesome power, but she has the purity of will that we lacked for so long. She is a goddess walking among mortals." Among the leadership of the Kabal of Lost Souls, only Syrillia has no need to fear her Archon. 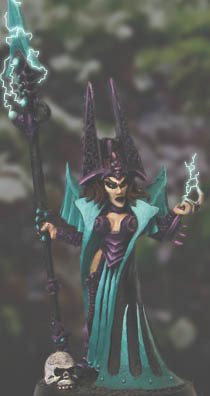 Originally a sorceress on a primitive world surrounded by warp storms, the young psyker caught Nemesis's interest, and since then the Archon has moulded her protégé into one of the most feared individuals in Commorragh. "Our lives are defined by that which we reveal to others. By controlling what we reveal, and when, we may control those around us as easily as pawns on a chessboard." Selyna replaced her father Surahk as Master of Warriors after assisting Nemesis in tricking Surahk into giving up his house's political files, a source of tremendous power among the Lords of Commorragh. Selyna's Warriors are trained in all modes of warfare, and she is an unforgiving mistress to those who fail to perform to her expectations. "There are two truths in the galaxy, beauty and death. Of these death is transient, and beauty eternal - our gift to the lesser races is to touch them in death with our immortal beauty." Xanthia had been one of the leaders of the Wych Cult of the Wolf, before Nemesis took control of the Cult by killing anyone who stood in her way. 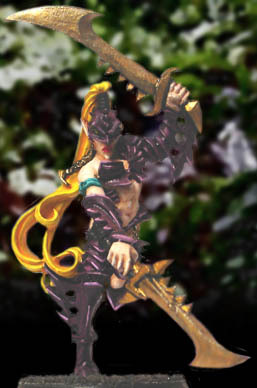 Xanthia immediately recognised Nemesis as a superior opponent, and betrayed her companions without hesitation. She now leads the Kabal's Wyches, whose ranks are continually swelled by the warriors that the Kabal buys or abducts from the Arenas. "How can I explain the revelation? To find that the world you knew for so long is a mere shadow of the truth." 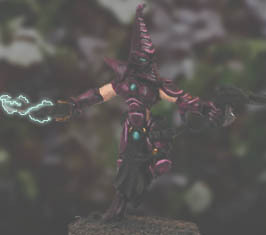 A rare psyker among the Dark Eldar, Karainn is able to project herself into the minds of others. During combat she is very difficult to defeat, because her opponent must fight her both in body and mind. Nemesis has allowed Karainn to develop her talents, making her the leader of one of the Kabal's main warbands, and giving her the hover barge Death's Kiss, able to move from world to world by generating its own webway links. "I am now finally what I was destined to be. You would say I had been changed, but I have merely become what my soul has always been." 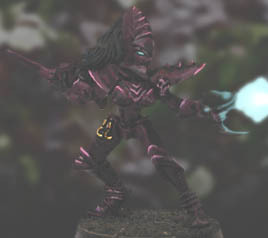 Kalarte still appears to be the normal Dark Eldar she once was, but beneath her skin she is now more machine than living being. On a whim Nemesis rebuilt the young warrior as a Biodread, using complex biotechnology and wraithbone cybernetics, turning her into an unstoppable killer. Beneath the layers of sense augmentation and combat neuroware, Kalarte's mind remains untouched, fuelling her enhanced body with hatred and lust for blood. "She wants nothing but death, but it is beyond her to harm such beauty as herself. So she seeks to destroy all that is imperfect, weaving a dance of destruction through the world." Only Nemesis knows the true name of the warrior she calls the Dancer. She was once a Harlequin Solitaire, but now serves Nemesis with unswerving loyalty. While away from the battlefield she speaks to no-one but her Archon, and does nothing but meditate in silence. Only in battle does she discard this facade, fighting with a hateful rage that borders on insanity. "In their arrogance, they tried to rescue me. They thought that their worthless way of life would still call to me, after I had seen the power, that which I had always been forced to deny in myself. Ask their skulls now if they still believe that." As a Howling Banshee aspect warrior, Sona had only just begun her training on the Warrior Path. 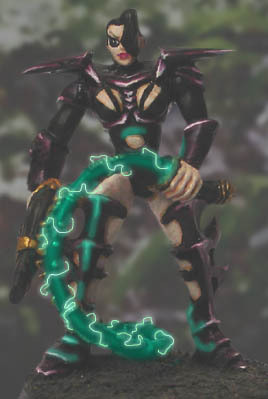 She was captured in battle by the Kabal, and Nemesis turned her away from the Eldar Path, replacing the guidance of her Aspect with the dark instincts of the Eldar soul. Sona now despises the weakness of her former comrades, who need technology to duplicate the Banshee cry she now summons from inside herself. "We are taught, falsely, that strength equals power. The truth is that power comes from order. 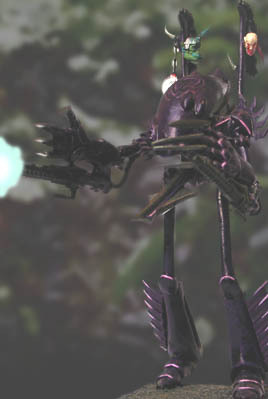 Even the humans, in their limited way, understand this, so it is a perculiar irony that the Dark Father of the Incubi, he who believes himself to be the perfect warrior, does not." 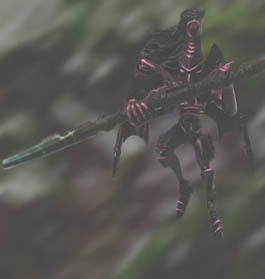 It is rumoured that Liu-Tze once challenged Arhra, the Fallen Phoenix and Master of the Incubi, and defeated him. In defiance of the practices of the Incubi she refused to take his armour, declaring that his spirit was not fit to become a part of her. Liu-Tze now serves Nemesis, who is able to protect her against the vengeful Dark Father while she builds her forces for the time when she will lead them against the Incubi loyal to Arhra, finally destroying the ancient Exarch. 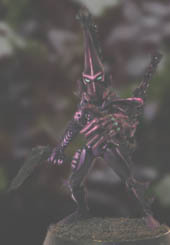 "We place the bodies of tormented foes within a Talos so that their rage at us may find expression. 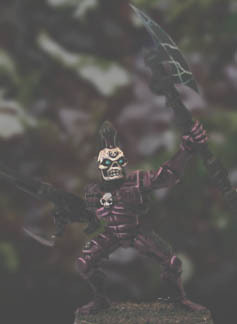 The craftworlders have no such consideration for those they condemn to the living hell of eternity without the pleasures of the flesh." 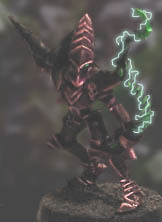 Athiok was once an Eldar Wraithlord, a mighty warrior who had served his craftworld in life, and continued to do so in death as a dreadnought. Nemesis captured the ancient warrior and found the weakness in its mind, the suppressed longing for the simple sensations that were lost when the warrior died and became a Ghost Warrior. Athiok's devotion to his craftworld crumbled, and he now fights for Nemesis, enraged at the loss he was forced to endure by his people. "There are those who say it is a different thing to kill than to train - they are wrong. There is only ever the body, its form and motions. It makes no difference whether it is blood or air that touches the blade today." 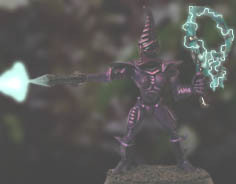 Kallian, known as the daemon slayer, is one of the most dedicated of the Wyches. Unlike most she does not care for the attention of the audience, but her single-minded pursuit of perfection makes her one of the most highly-rewarded warriors in the Arenas. "She would sooner kill another being than speak to it, and yet she cares for those savage creatures as if they were her own children." Though young, Cehara has spent almost all of her life in the company of her warp beasts. 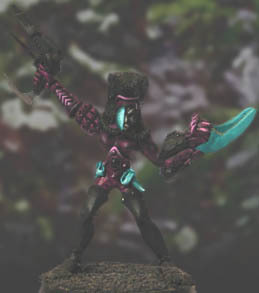 She has an almost telepathic bond with them, and can understand every nuance of their behaviour, but she has come to regard other Eldar as strange, loathesome beings entirely unlike herself. "His entire life is spent in the catacombs, experimenting. To call him a living being is to stretch the term to its utmost - in a way he is nothing more than a torture engine." 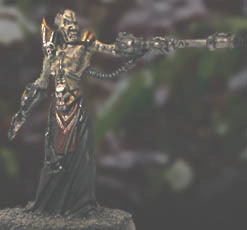 One of the few Haemonculi to survive under Nemesis's reign, Khanishkaran is alive thanks to his expertise in creating and maintaining the giant Talos war machines, and his tendency to be so absorbed in his work that he ceases to acknowledge the existence of the world outside his laboratory. "What purpose is there, that the lesser races claim to follow? There is no right or wrong, no good or evil, no truth or lies. These things we know, and yet so many still refuse to see what is plain, that there can be no logical purpose to life but to be alive." One of the higher-ranked of the Sybarites, Rathai would be considered a threat by the Dracons were she not completely obsessed with satisfying whatever whim occurs to her. Given the luxuries that Nemesis allows her, she is unconcerned with advancement, and has no ambition beyond the continuation of the status quo. "Look at them, the creatures scurrying along the ground. So like insects, waiting to be crushed." 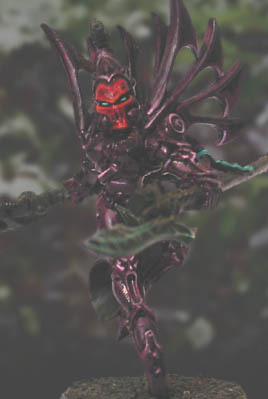 Anastari's love of flight is such that he has had his wings and armour grafted onto his body, to allow him total control in the air. Although quite insane, he is a master of aerial combat, taking particular pleasure in swooping low through the ranks of enemies, beheading them as he passes. "Savagery is the business of animals. We are higher creatures, and to us violence is merely a tool at our disposal." 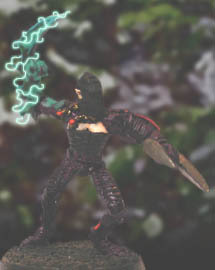 One of the few warriors able to duel with Wyches and survive, Voth is devoted to the study of combat as a science. Her preferred weapon is an ancient power sword, a thin sabre said to date from before the Fall. "To those who ask what use is a madman, I would answer that there is a kind of madness that can drive a bare fist through solid steel." Atrox was once a normal warrior, but his mind has long-since been drowned in a sea of blood. Between battles he must be restrained to prevent him from attacking anyone he sees, but when the time comes to go to war he becomes the perfect soldier, fearless and brutal to his enemies. "It cannot be imagined. The sheer power of the machine, the rush of the wind, the scream of the blades as they slice open the air itself." Riana's only goal in life seems to be high speed and perfect control. She is so familiar with her personal jetcycle that she can steer it at supersonic speed with millimetre-precision. "She would certainly be a threat to those above her, were she not so easily distracted." Although young, Satyra is already one of the finest of the warriors due to her absolute enjoyment of combat. She has, however, a tendency to enjoy practically anything, making her unpredictable among the ranks of the Sybarites. "These creatures are so fragile, it's a wonder they can fight at all." Ashka delights in tormenting her prisoners, sending them through alternating stages of hope and despair until their minds break under the strain. She is continually searching for a worthy opponent in her mind games, but has yet to find one among the captives she has taken.